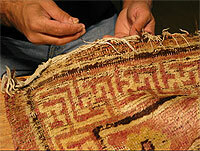 Persian rug cleaning services for Marina Del Rey are provided by Antique Rug Company. We serve Marina Del Rey and surrounding areas including zip codes 90295, 90292. The methods of cleaning handmade area, Persian, Navajo and Persian rugs are generally similar but vary in specific details. Here at Antique Rug Company, we use the proper method suitable for the rug at hand which caters to the particular needs of each individual rug. Among issues to consider are condition, pile fiber content, dyes, foundation type and weaving type of the rug. Our vast experience ensures a proper servicing of your valuable rugs each and every time. Please contact us with any specific concerns you may have. Over the years, we have successfully remedied all kinds of stains, including pet accidents, dye bleeds and water and moisture damage. Your Persian rug is a valuable investment. With proper care, it will provide you with generations of use and enjoyment. Our expert Persian rug cleaning services are aimed at meeting the needs of each individual rug we care for. We do our best to protect, preserve and enhance the investment in your valuable rug. Examine every rug to determine the appropriate cleaning process. Determine pre-cleaning security for older rugs. Check for stability and fastness of dyes. Dust rugs prior to washing using the most current methods available today. Deep dusting is an important step in the cleaning process and is usually not included at cleaners offering on-site cleaning, dry cleaning, steam cleaning and other non-water immersion cleaning services. Apply pre-treatment for stain removal. We Hand wash every rug. We offer pick-up and delivery for Marina Del Rey and surrounding areas. © 2018 Antique Rug Co.